Want to make witnesses hate you? If I had to add it all up, I know that I’ve logged more than 10,000 hours in the courtroom. Between jury trials, non-jury trials, motion hearings, docket soundings, conference meetings, status checks, plea hearings, and miscellaneous courtroom arguments, I have spent a lot of time in a lot of courtrooms. I’ve been the lead trial lawyer on cases, sat second chair, been a witness, been called for jury duty, and even put on the robe to judge mock trials and teen court. With all of that courtroom experience, you’d think that I would have been ready for what happened a few years ago when I was called to the witness stand… But I wasn’t. My experience as a witness was one of the most frustrating experiences I’ve ever had in a courtroom. Here’s the story of what happened, and five guidelines to prevent your witnesses from turning against you. 1. Tell your witness EXACTLY where to go. I normally try cases in our downtown courthouse, and I’ve been to all of the outlying courthouses for miscellaneous hearings. But I’d never been to this courthouse before. The courthouse was located at the jail complex, and I didn’t know which building I was supposed to go to. I had to poke my way around a little bit before I was able to find the right building. Once I finally found the right building, I had no idea which floor I was supposed to go to, and I had no idea which of the two courtrooms I was needed in. Even when I found the right courtroom (which was behind bulletproof glass) I wasn’t sure if I was supposed to wait outside with everyone else or if I was expected to ask a guard to let me inside. Even if you think your witness knows their way around the courthouse, don’t assume that they know where to go. Tell them not only where to go, but where they should park. If there is more than one building, tell them which one they’ll go to. Tell them how to navigate through the metal detectors. Once they’re inside the building, which floor do they need to find? Which room? Should they stay outside the courtroom, or should they walk inside? Remove all doubt from their heads — tell them exactly where to go. 2. Tell them what to bring to court. How much will it cost to park their car? Will they need to bring cash, or does the garage accept charge cards? Will they need to bring coins to feed a parking meter? Should they bring something to occupy their time while they wait? Should they bring a book or magazine to read? Is it okay for them to bring a laptop and do some work while they wait? 3. Tell them what to leave behind. As I mentioned, this courthouse was at the jail, so security was heavier than at a regular courthouse. Luckily, I’ve been to jail before (always on the “Just Visiting” side of the board) so I knew to leave prohibited items (like my cell phone and the shiv I made by sharpening a spoon) outside in the car. If there are any items your witnesses shouldn’t bring to the courthouse, tell them specifically what they can’t bring. And don’t limit your list to items you don’t want them getting caught with at the security lines, like drugs or weapons. Tell them the other items that you don’t want coming into the courthouse. For example, if someone brings attorney-client privileged documents with them to the witness stand, the opposing attorney may be entitled to review them. If the item isn’t necessary to aid their testimony, tell them that they’re probably better off leaving it at home. I was told to be in court at 1:30 PM for a 1:30 hearing, that I was the only witness, and that my testimony wasn’t going to take any longer than a few minutes. Relying on that information, I blocked off 1:30 PM – 3:00 PM on my calendar, just to be safe, but left two important appointments on my calendar: An appointment at 4:00 PM, and a speech to the law school at 5:00 PM. 2:30? 3:00? 3:30?!? Nope, nope, and nope. As the clock ticked past 3:00 PM, I started getting antsy. As 3:30 came and went, and I started realizing I wasn’t going to make my 4 o’clock appointment, I started getting upset. And as the small hand spun past the 4 o’clock position, I moved from upset to angry. Things would have been more relaxing if someone had simply lied to me: “Don’t schedule anything this afternoon, because this is going to take all afternoon. You might even need to stay past 5.” If someone had lied to me, I would have rescheduled everything else and just planned to spend the entire day in court. Not only that, but instead of being irate when I was finally released at 4:15 (more than two hours longer than I’d expected), I might have actually been happy about it, thinking they’d gotten me out early. Those were the only words I spoke in the entire hearing. As I was being sworn in, the judge asked the lawyers to approach the bench. They spoke for a few moments, and then announced that the case was being continued to a later date until a companion case could be resolved. My entire afternoon was wasted, and they hadn’t even needed me for the hearing. How cooperative do you think I’ll be when they ask me to come to the next hearing?!? Just because we can issue subpoenas and force people to sit in court doesn’t mean we should. The easiest way to convert a friendly witness into a hostile witness is to disrespect them or waste their time. If there’s a chance your witness won’t be needed, tell them up front. As soon as you find out that the hearing is going to be cancelled or that you don’t need their testimony, tell them immediately and apologize for the inconvenience. In short, the best way to keep your witnesses from hating you (and possibly sabotaging your case) is to follow the Golden Rule. Treat your witnesses like you want to be treated, and you won’t turn your witnesses into enemies. 1. Recognize what they’re doing. Why do these attorneys do it? Why do they act like such jerks? They do it because, unfortunately, these tactics sometimes work. It’s not uncommon to see experienced criminal defense attorneys yell, bluster, or berate young prosecutors until the “newbie” prosecutor gets flustered, loses his train of thought, and caves in to the defense attorney’s demands. Some attorneys know that if they can get under your skin, you’re more likely to make mistakes or to let your personal feelings interfere with your professional judgment. If you recognize what they’re trying to do, you can immunize yourself from the attack. 2. Don’t take the bait. Once you recognize their tactics, you must control yourself and avoid rising to the bait. You know that he’s trying to get you riled up so that you say something stupid. You won’t fall for it if you’re prepared. Count to 10 if you have to, but don’t take their comments personally. You need to keep your emotional level calmer than theirs. The worst way to respond to their comments is by responding emotionally or getting angry. (After all, you don’t get smarter when you get angry, do you?) Fortunately, many of these antagonistic attorneys are usually “one trick ponies” — if yelling and screaming doesn’t work, they often don’t have a fallback negotiating position. After you say the phrase, it’s important to be quiet. You don’t need to say anything else. Simply respond, “You may be right,” and then wait until your opponent responds. I find it to be wonderfully disarming. It’s the verbal equivalent of a well-executed judo maneuver — you move aside, then use your opponent’s energy against him to push him to the ground. It would be wonderful to think that your opponents will stop acting like jerks, but let’s face it, that’s never going to happen. We’re trial lawyers — confrontation is hard wired into our DNA. Accept the fact that some of the attorneys you’ll deal with are going to be jerks, and you can prepare yourself in advance. Learn to recognize the tactic, vow to avoid taking the bait, and plan how you’ll respond in advance. When you follow those three guidelines, your opponents will never be able to get under your skin again. Do you know what the most dangerous word in your vocabulary is? You say it all the time. It’s the most commonly used word in the English language. If you listen to any conversation, especially conversations between lawyers, you’ll hear this word more often than any other. More than any other, this word leads to claims of improper argument and unprofessional conduct. Which word is it? That’s right – “I.” The shortest word in the dictionary is also the most dangerous. But what makes it so dangerous? “I” is dangerous because it leads to statements like “I think…” or “I believe…” Regardless of whether it’s an argument to the judge, a statement to the press, or an offhand comment during final summation, these seemingly innocuous phrases can have disastrous effects. The phrase “I believe” can overturn an otherwise valid verdict, or lead to disciplinary referral. The rule was designed to prevent loathsome clients from finding themselves without representation. It doesn’t matter whether you think the case is a winner or a loser, you are obligated to take up the cause and represent your client as best you can. The barrister’s personal feelings are irrelevant. He is there to argue one side or the other of the dispute, not to express personal opinions. That’s the “official” reason why you shouldn’t state a personal belief in your case. Here’s a more compelling reason why you shouldn’t state your personal opinion in a case: It’s not persuasive. Candidly, who cares what you think? It may sound harsh, but, in the courtroom, who cares what you believe? Unless the jurors personally know you and trust your opinion, why should they believe something you say? Simply because you said so? All of these comments were made by competent, experienced, and professional courtroom advocates. Yet somehow, they resorted to using one of the weakest argumentative devices available. It’s the same argument your mom resorted to when she couldn’t think of any other reason why you needed to go to bed: “Because I said so!” It wasn’t persuasive then, and it’s not persuasive now. Think about it for a moment. Which idea do you prefer – the idea that someone else proposes, or the one that you think of on your own? Once you reach a conclusion on your own, you take personal pride in the conclusion. When someone attacks your conclusion you’ll not only actively disagree with them, you’ll cling even closer to your conclusion. Jurors and audience members are the same. They like their ideas better than they like your ideas. Using “I” or stating your personal opinion shortcuts your persuasive powers. They aren’t going to believe something just because you say it’s so. 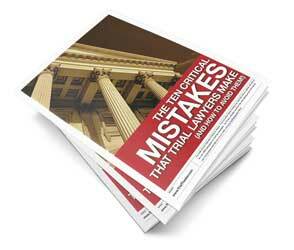 Avoid the risks of a re-trial or a professional remand by omitting “I” from your vocabulary. Start by reading through the draft of your next presentation. Every time you see the word, “I,” strike it from the page. Can you replace it with the word “you”? Your jurors, readers, or listeners care more about themselves than they do about you, anyway. Give them what they want – talk about them. Approach your argument from their perspective. When you strike “I” from your courtroom vocabulary, you’ll become one of the most persuasive attorneys in your courthouse.